Britepaths welcomes young people in our community to volunteer with us, and we have a variety of opportunities available throughout the year. Often we will post immediate needs on our main Volunteer page, so that is the best place to check for new and current opportunities. Below are our current needs. Contact Joanne Walton at jwalton@britepaths.org or 703.273.8829 if you have questions or would like more information. Run a Food/Donation Drive: Britepaths has an overwhelming need for supporters in our community to raise food and funds to help us assist families in our Food Bridge temporary food assistance program. You can make a big difference by running a food and grocery store gift card donation drive in your neighborhood, school, or at a local grocery store. We can help you set up the date and time of your drive if you wish to run it at a grocery store. Great group activity! Details at: https://britepaths.org/RunAFoodDrive. 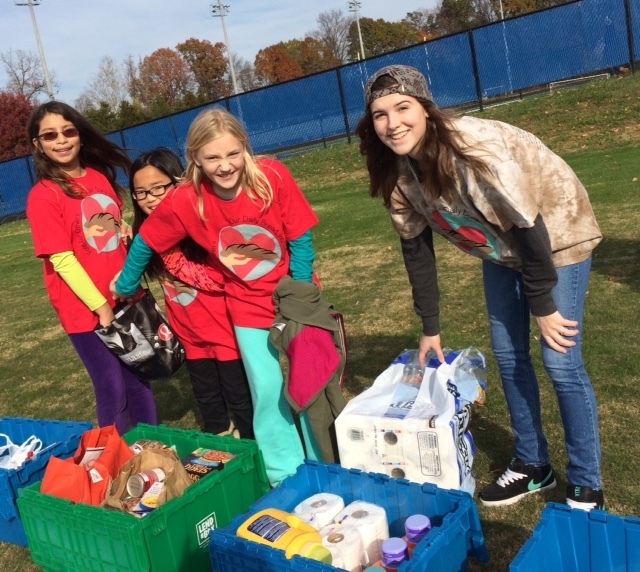 Donate Food & Assemble Weekend Food Packs for Children: Britepaths’ Food4Thought Program partners with numerous FCPS schools to help them send weekend food packs home with students in need at their schools. We have an ongoing need for community members to assemble weekend food packs and deliver them to our partner schools. This activity involves supplying the food yourself, but you may run a donation drive to collect the food. Great group activity. Details at: https://britepaths.org/f4t-volunteer-project. Information Tables. Britepaths occasionally has opportunities to volunteer at information tables we set up at community events or festivals. The volunteers who take shifts running these tables provide vital assistance to our families by helping us get out the word to community members about how they can donate or volunteer. Volunteering involves handing out information about our programs and fall events and helping kids with a fun and simple craft. Youth under 16 need to volunteer with a parent or person 18+. Most of these opportunities are in the fall, but sometimes we have a need other times of the year, so check our Volunteer page.